How did I miss the shop? ?? It is a good news about Kober! I was looking for this shop on the usual place on the Graben and I did not found it! I thought that they went out of busines - and I was very sorrow about it! Next time (this autumn) I shall visit them in their new location on the Schülerstrasse! I just called Mr. Böhm on Telephone. The Shop ist open at the Moment. 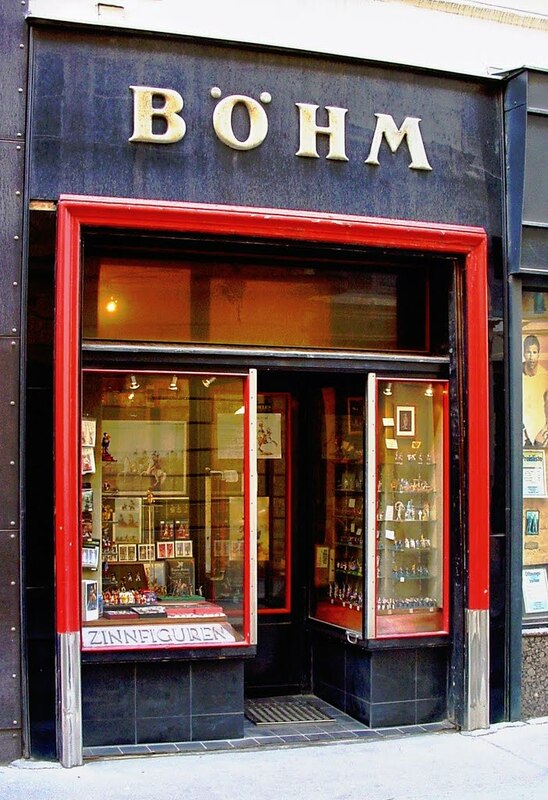 So Zinnfiguren Böhm is not in Business anymore? Very Bad News. They have the Wollner Figures. This is the shop I was writi8ng about earlier. Actually I was not there this year, but last autumn it was still existing. I went to the Vienna address given here below, and I regret to say there is no flats shop there. In fact, it appears there never was? I have gone to the website. It looks like a very talented group of painters. I will see if I can make contact. 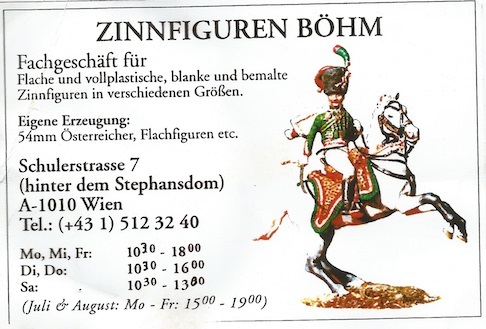 It is a group of Collectors mainly in Vienna. If you have more questions, I think you will get help. (I am not from Vienna, but I met Mrs. Horejsi at a little modelling show in Styria this year.She also take painting orders, and she knows Mr. Urbanke, who cast the moulds of the late Mr. Kovar.Have a nice trip to Vienna. So many wonderful suggestions! I am looking forward to my visit to Vienna. an Doyen of Austrias Collectors Mr. Pohl (from old Germanics to Radetzky - many figures for Parade vor Feldmarschall Radetzky)Catalogs are to download on website. Will do! As a retired History teacher this museum is a must see. Thank you, Peter. We are staying in Vienna for four days which from what I have been reading will probably not be enough. However a short drive from the city to see something of the countryside (and the possibility of buying flats!) sounds inviting.